Pets for Patriots has a long-standing tradition of bringing together veterans and shelter animals. This win-win program has had positive results for so many and this special story about Alexis and Eddy is one shining example. 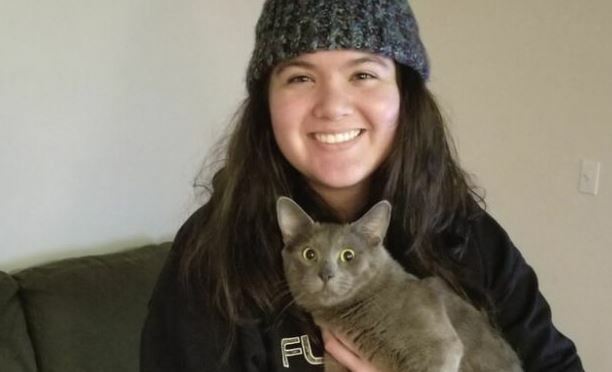 Being over 3,000 miles away from family can be difficult for anyone, but one young sailor has been able to make things a little more bearable thanks to her adopted cat. Alexis told Pets for Patriots, “I joined the Navy when I was 18 because I felt a calling to serve. I also didn’t know exactly what I’d like to do when I grew up.” The Navy has given her the opportunity to explore new horizons during her enlistment. “Though I have only been in for four years, I have learned an immense amount and gained a lot of life experiences that I’m thankful for,” she says. After being at sea for six months and back from deployment, although she was happy to be stateside, there was an emptiness. Dealing with the stress and loneliness of deployment was difficult so Alexis thought a companion pet might fill that void. She received recommendations from an associate and friend that lead Alexis to research Pets for Patriots. Impressed by all she read, including affordable adoption fees for military veterans among a range of offered support. “It’s great that they help fellow service members help shelter animals. It’s a win-win for both parties, and that’s truly inspirational,” she said. Kitsap Humane Society is one of the organizations that works with Pets for Patriots and near to Alexis. She went to visit to location and the end of 2017, seeking that perfect buddy. That’s when she met Simon. The three year-old gray cat had arrived at the shelter just after Christmas, but without much of a story. What was known was he was a cuddler and very affectionate. “The day I adopted him was the first day he was able to be adopted, so I was super lucky to be able to pick him,” and on the first day of the new year, they became family. Alexis and the now named Eddy make for ideal mates. The special bond that Alexis and Eddy share is just one of many thanks to the Pets for Patriots companion pet adoption program. Their hope is that stories like theirs will encourage more Pacific Northwest veterans get in contact with the organization. Adorable! I am sure he is so happy.